Abstract: This paper presents an excellent review of common errors and problems in the pole vault and offers ways to correct them. It is a must read for coaches and athletes in the event. The paper was originally published on DrTrack.com in December 2001. It was transferred to and republished by Glass Dragon Digital Publishing in February 2007. Mike Thompson begins his 12th season as head men's and women's track and field coach at Binghamton University in 2006-07. During his tenure, he has guided Binghamton from the NCAA Division III level to its current status on the Division I level. Since he joined BU's staff in 1994, Thompson has produced 33 track All-Americans, including eight national champions, six runners-up and five third-place individual performances. This past season, he coached Rory Quiller to a runner-up finish in the pole vault at the NCAA Division I Indoor Championships. Quiller jumped 18-0 1/2 to become the top collegiate vaulter in history from the northeast region. Numerous honors have come Thompson's way during his tenure at Binghamton. In 1998, he was named New York State Coach of the Year for both men's indoor and outdoor track. 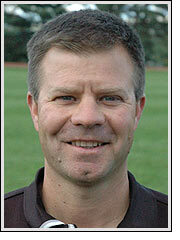 Thompson also was selected as NCAA Division III Regional Coach of the Year indoors and outdoors. Two years prior, the Colorado native was named NCAA National Coach of the Year after leading the BU women's indoor team to a sixth-place finish at the NCAA Division III Championship. In 1997, Thompson earned his first New York State Coach of the Year honor after his men were runners-up outdoors. In 1999, Thompson's men placed 3rd at the New England Collegiate Conference (NECC) Championship, fifth at the Eastern College Athletic Conference (ECAC) meet, and took 10th at the NCAA Division II Indoor Championship. The women, meanwhile, were third at the conference championship, seventh at ECAC's and 16th at the NCAA championship - all in the program's first year at Division II. As an athlete, Thompson captured both the indoor and outdoor NCAA Division II pole vault titles in 1989. He was a three-time All-American, four-time conference champion, and still holds the UNC pole vault record at 17-7 1/4. In 2003, he was inducted into the Northern Colorado Hall of Fame. Thompson holds a bachelor's degree in communications and a master's in physical education, both from UNC. In addition, he also has his USA Track and Field Level II Certification in the Jumps, Sprints/Hurdles and Throwing Events. Thompson has won four pole vault titles at the Empire State Games (1995, 1996, 1997 and 2004). He and his wife, Sarah, and their two children, Kelly (7) and Rory (4) live in Binghamton. Both are instructors in the University's physical education department.